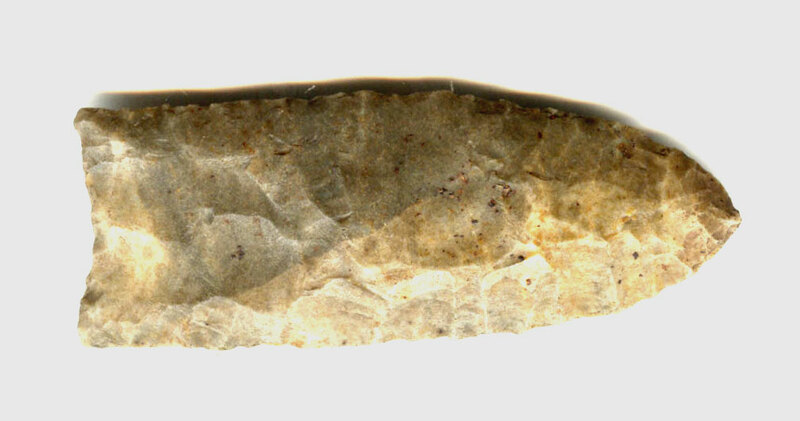 A Medium To Large Size, Multi Colored, Visibly Aged And Anciently Use Sharpened, Well Made, Multi-Fluted Clovis Point That Exhibits Surface Sheen And Stone Aging Coloration Patination, Aged Surface Deposits, Correct Rolled Basal Stem Edge Hafting Dulling, Correct Early Type Flaking, Correct Blade Sharpening Use Reduction, Correct Material And Manufacture For The Area Found. Found By Donald Frost On The White River, In Owen County Indiana. Ex-Donald Frost, Leo Paul Davis And Mitch Lewis Collections. This Excellent Example Is Made Of A Nice Material, In Very Good Condition! Includes Dwain Rogers, Ken Partain And T&T Archaeological Consulting, ( Tony Putty ) Certificates Of Authenticity.